Get ready for what will surely be one of the most fabulous events in recent African American theatre history. Previews begin February 12th, 2008 at Times Square's Broadhurst Theatre for the extraordinary Broadway revival of Cat on a Hot Tin Roof, directed by black theatre and dance legend Debbie Allen.Often regarded as one of the great gems of the American theater, Tin Roof is a Tony-nominated masterpiece by Tennessee Williams (Winner of the 1955 Pulitizer Prize in Drama). 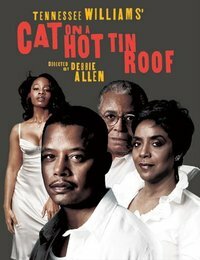 Cat , which has traditionally been cast with all white actors, tells the tale of a southern family in crisis. The play features some of the most memorable characters in American theatre history, such as the larger-than-life Maggie 'the Cat,' her alcoholic husband, Brick, and the dominating family patriarch, Big Daddy. But America has never seen at a cast quite like this: this incredible, all black line up includes Academy Award® nominee TERRENCE HOWARD, the handsome and talented GIANCARLO ESPOSITO (Fresh), LOU MEYERS (A Different World) (Dr Tony Award® winner ANIKA NONI ROSE (DREAMGIRLS, CAROLINE OR CHANGE), Academy Award® nominee and two-time Tony winner JAMES EARL JONES. The legendary PHYLICIA RASHAD, the queen of black drama stars as "Big Mama." This is going to be a disgustingly monumental event, trust me. Expect cast appearances on Oprah and probably a few black magazine coverspreads. But dont blink, or you'll miss the show: Cat will only be up for a strict six week engagement. Buy tickets today by visiting http://www.cat2008onbroadway.com/index.html.